Follow the build process of Muninn and Huginn below. The Raven Project hatched from an opportunity to commission a body-blank of Swamp Ash, with minimal routing already in place to then customise with my own bespoke body-shape. For example, the neck pocket and control routing were completed on a square slab of timber. This allowed Chloe and me to gradually work on a body design, using this wood as a blank canvas. 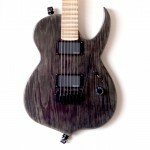 Initially a one-off build, it transpired that I was able to secure two identical pieces for a very reasonable price from Phil at Guitarbuild.co.uk. It had been my intention from very early on in this project that I would theme a short run of guitar builds on Norse Mythology, so now I had a twin set of builds, Odin’s Ravens seemed to be a perfect idea. 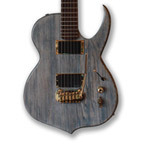 The design progression went through variations of Ibanez, Carvin, and Warmoths WGD body shape but in the end we went for an amalgamation of a few. These are the only Raven design builds in existence to date, but the body design will be resurrected in the future with slight variations including a carved top, contoured all-access neck joint and neck-through construction.